Kenneth Bryce Marshall (1942 - 2010) passed away on this day. RIP "Kilomike" I will miss you Ken, as will many who knew you. Ken has entrusted me with his slide collection. Here is a page of some prints that I scanned and returned to him. No idea what happened to his b & w negatives alas. The slides will follow on subsequent pages. 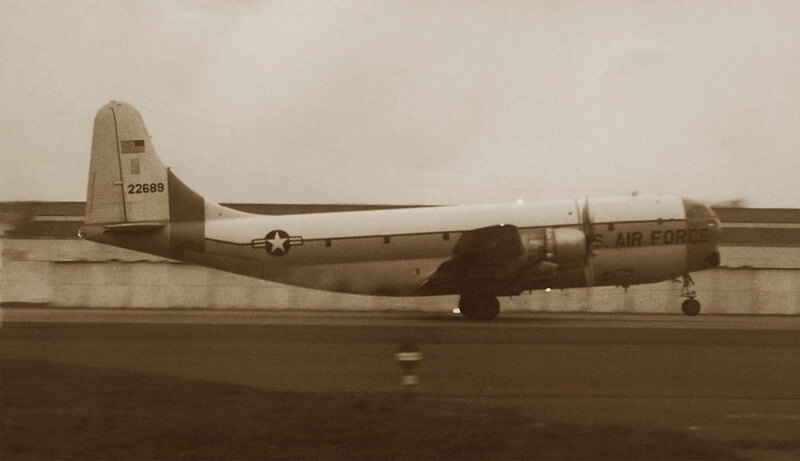 49-2598 Boeing C-97G Stratofreighter (16220) USAF lands in a blizzard. Only the hardy spotters were out! 56-2008 Douglas C-133A Cargomaster (45245) USAF - MATS safely parked at the USAF Green Terminal. Long time Prestwick resident 0-51057 parked behind. 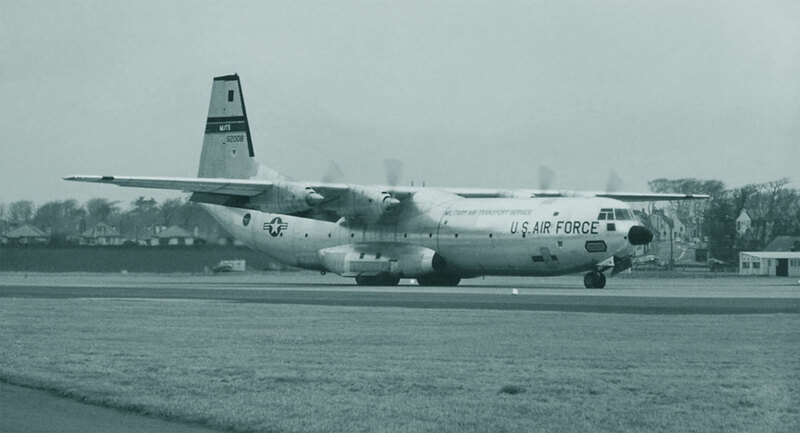 56-2000 Douglas C-133A Cargomaster (45165) USAF - MATS arrives at Prestwick. In later life became N200AR. 141316 Lockheed WV-2 Warning Star (4440 ) US NAVY MK/316 VW-13 Squadron. 20713 Canadair CP-107 Argus RCAF kicks up a spray. 45-0608 Douglas SC-54G Rescuemaster (36061) USAF 57ARS departs off on a training mission. Became N3373F in 1977, then unfortunately crashed into the sea after an engine fire on take off from Kenai, Alaska on 14 July 1981. 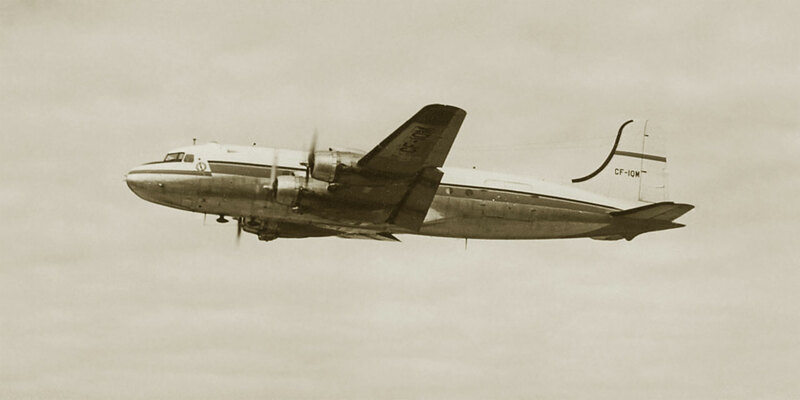 17502 Canadair C-54GM North Star (109) RCAF rumbles by, oh those murmuring, musical Merlins. 52-5943 Fairchild C-119G-20F Flying Boxcar (11130) USAF 452TCW March AFB., and 53-8093 Kaiser-Fairchild C-119G Flying Boxcar (196) USAF 733TCS Hill AFB., taxi off the active on 29 October 1961. 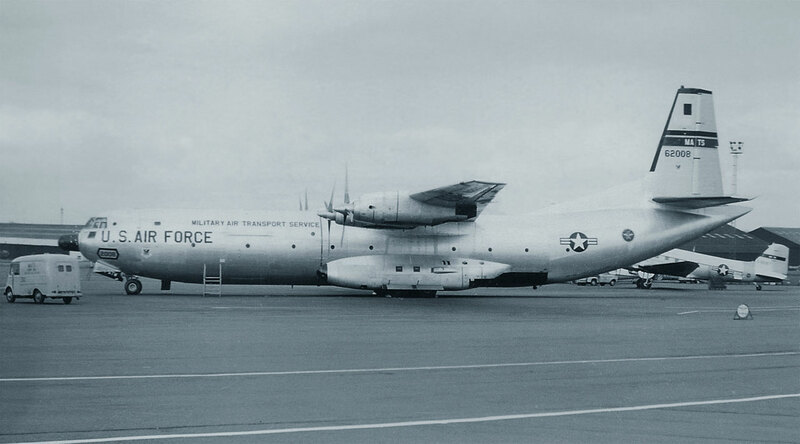 52-5943 went to the Inian Air Force in 1963. 53-8093 to Tiawan as 3141. 61-0328 Boeing C-135A-BN Stratolifter (18235) USAF - MATS. 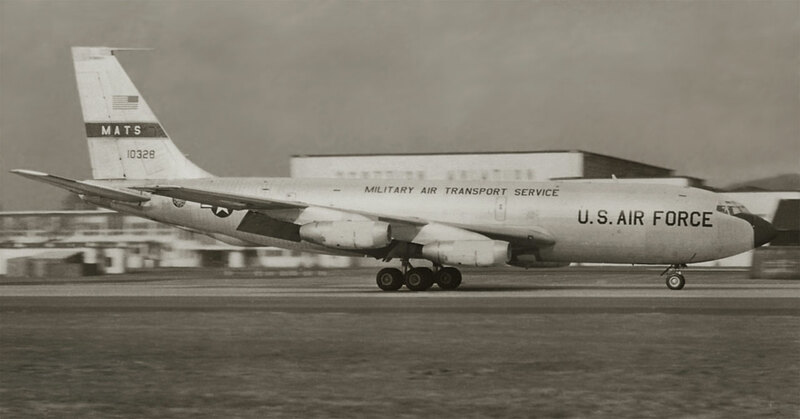 Later became an EC-135N of 4950th TW, and was written off 06 May 1981 - when it suffered an abrupt pitch-down resulting in a structural failure with ensuing midair explosion and crash near Walkersville, MD. All 21 on board killed. 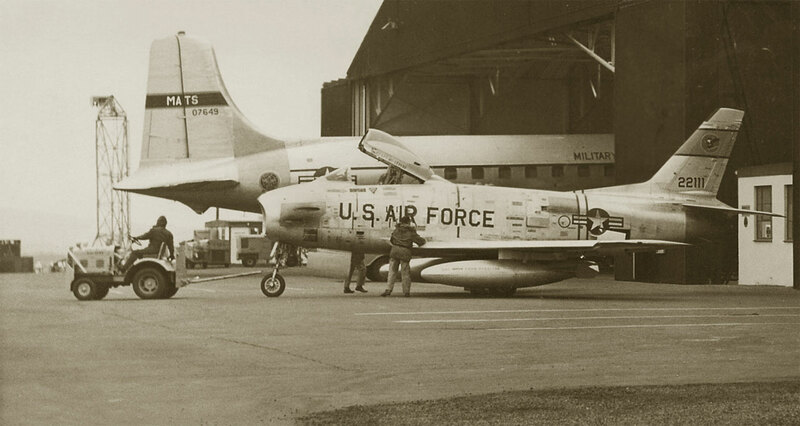 53-1331 North American F-86H Sabre USAF decorated with "Shamrocks". 52-2111 North American F-86H Sabre USAF gets parked beside hangared 51-17649 Douglas C-118A Liftmaster (43702) USAF - MATS. Note the strange serial presentation on the tail, no zero dash, just 07649. 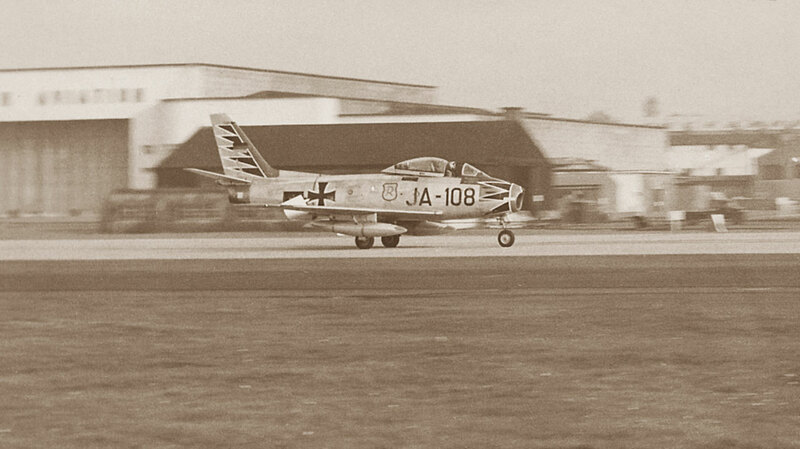 JA+108 Canadair CL-13B Sabre 6 of the Luftwaffe Jagdgeschwader 71 (JG71) "Richthofen". 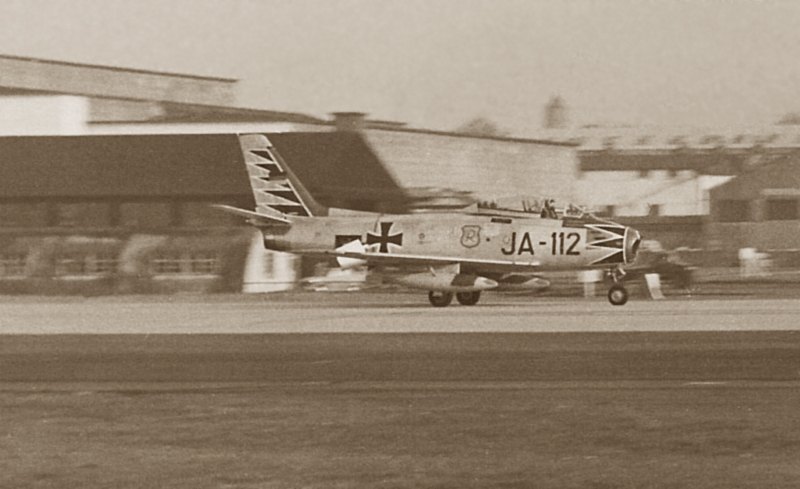 JA+112 Canadair CL-13B Sabre 6 (1626) of the Luftwaffe Jagdgeschwader 71 (JG71) "Richthofen". This airframe later went to Pakistan. 5301 de Havilland DH.106 Comet IXB (06017) RCAF. 5302 de Havilland DH.106 Comet IXB (06018) RCAF. CF-TGE Lockheed L-1049G Super Constellation (4544) Trans Canada Airlines on the Prestwick ramp. 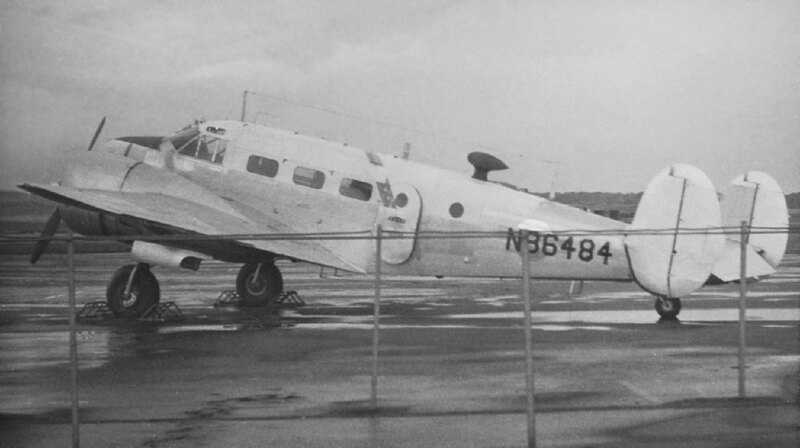 This aircraft is now with the Seattle Museum of Flight for all to enjoy. You can see the value in taking a busy cluttered ramp scene - it's not all that important to have a "clean" shot of an aircraft - here is a case in point. 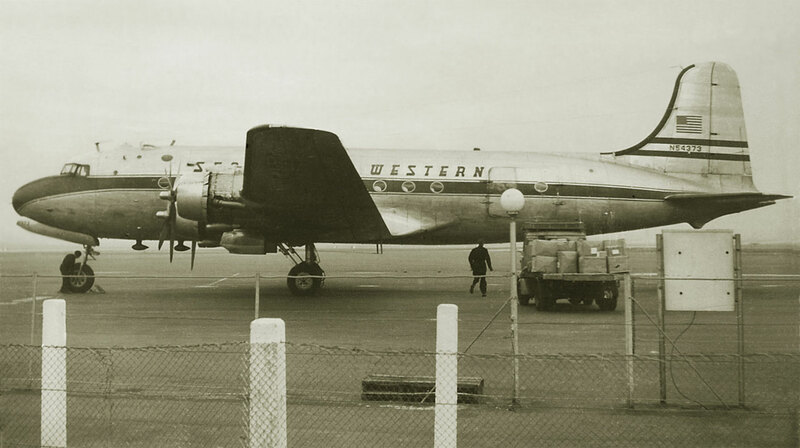 N54373 Douglas C-54A-1-DC Skymaster (10273) Seaboard & Western Airlines. 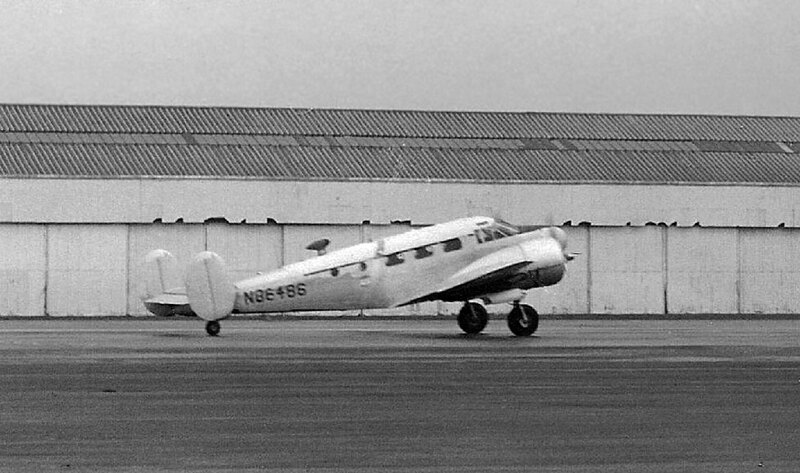 This aircraft was later converted to a Carvair, eventually crashing at Venetie, Alaska on 29 June 1999. 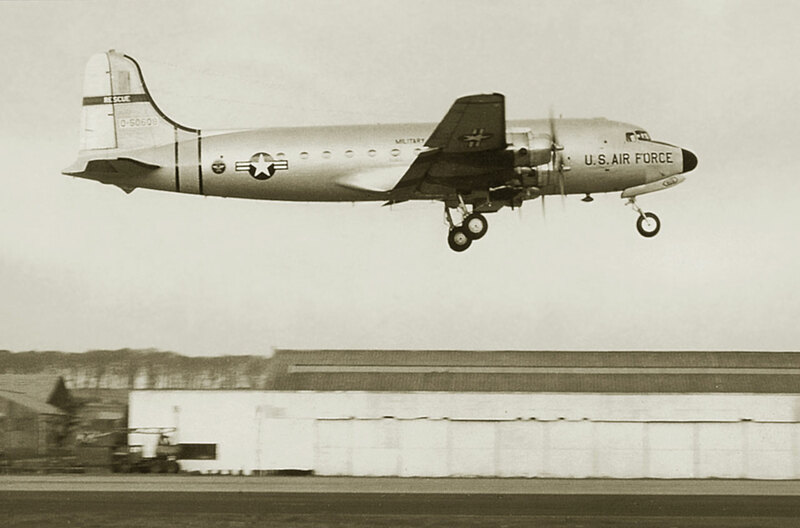 CF-IQM Douglas C-54G-15-DO Skymaster (36088) of Nordair departs Prestwick. She is still active (in 2011) with Buffalo as C-FIQM. 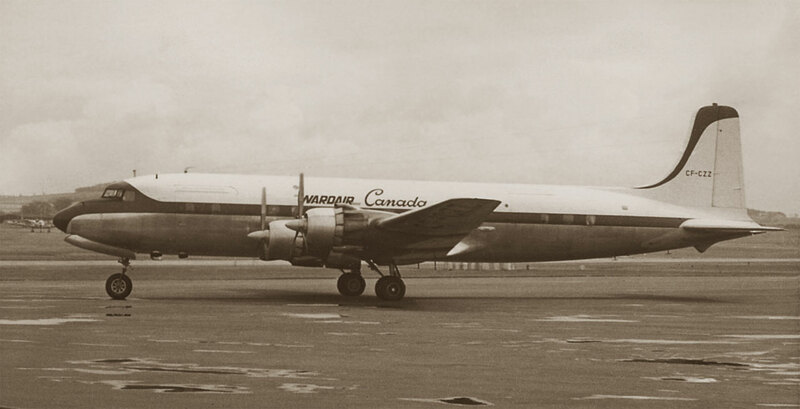 CF-CZZ Douglas DC-6B (45498) was leased to Wardair Canada in May 1962. CF-TFM Canadair DC-4M2 Argonaut (137) Overseas Aviation, crosses the main road over 13/31 at Prestwick. 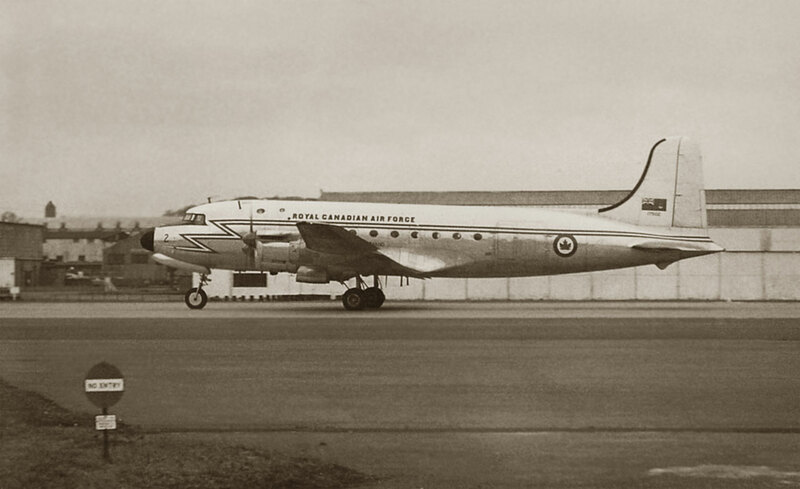 This aircraft crashed as I-ACOA near Garoua, North Cameroons 11 October 1966. N702PA Boeing 707-121 (17677) "Clipper Hotspur" Pan American. This aircraft was broken up as N702PT at Stanstead in March 1980. 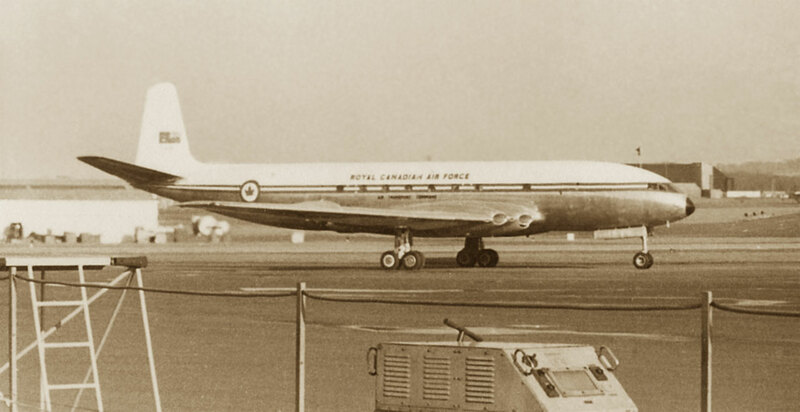 PH-DCK Douglas DC-8-53 (45614) KLM "Admiral Richard E. Byrd" touches down in front of a parked RCAF Avro Canada CF-100 Canuck. One of the Irish International Airlines Boeing 720-048 departs. 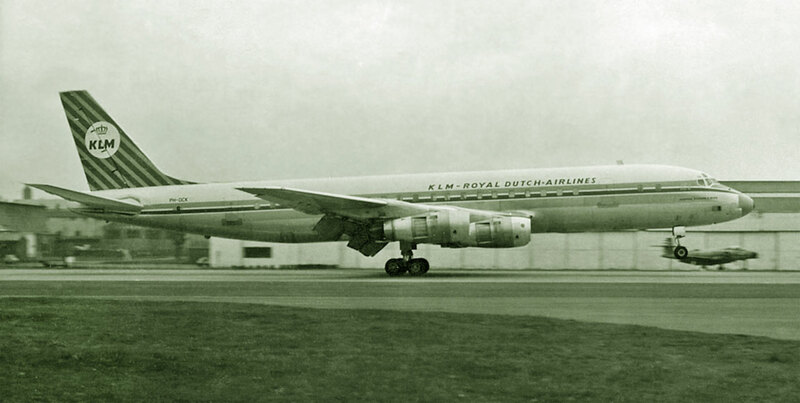 They operated three from 1961-1964, EI-ALA (18041) b/u July 1978; EI-ALB (1042) b/u September 1980; EI-ALC (18403). 52-2689 Boeing C-97G Stratofreighter (16720 ) USAF makes a dramatic dusk departure off 13. N86484 Beech C-45 Expeditor (AF-691) ex USAF - SAC. 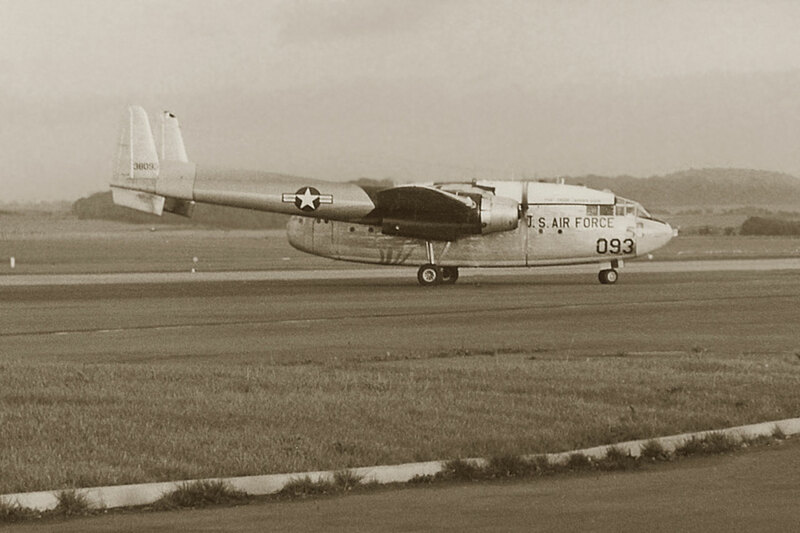 One of several caught by Ken passing through Prestwick. 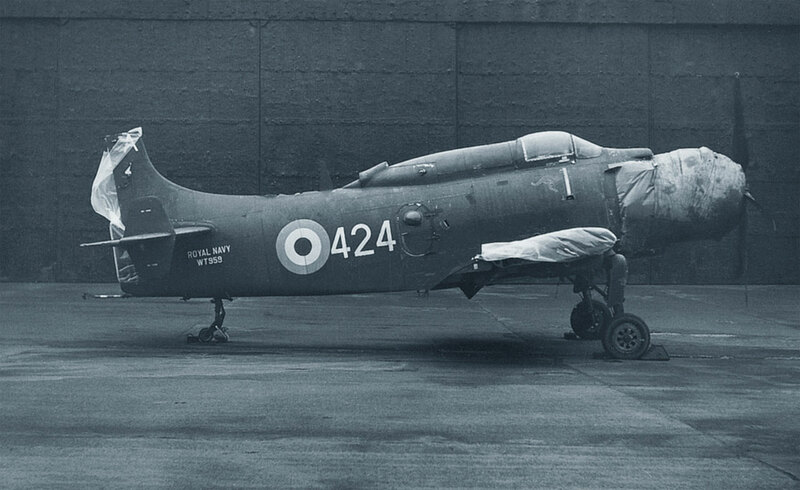 WT959 Douglas AEW.1 Skyraider (7972) of the Royal Navy's Fleet Air Arm. 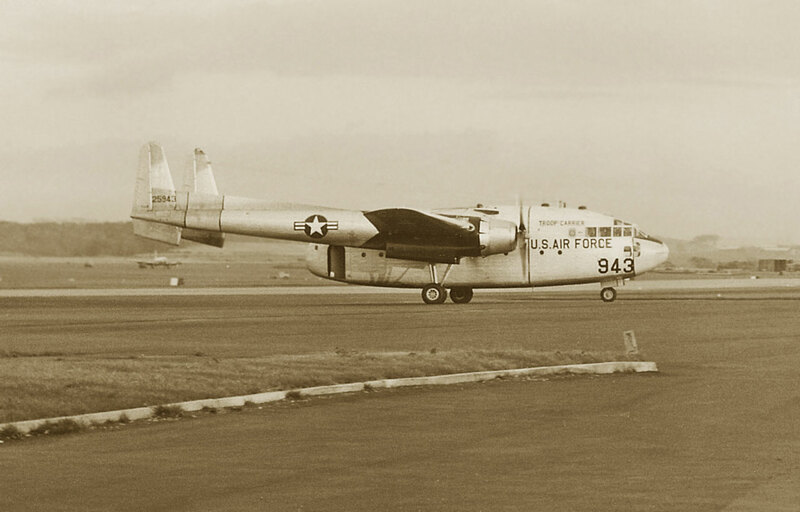 Ex 127957, G-31-13, f/f 1953, d/d 31/03/1953, to SE-EBC. 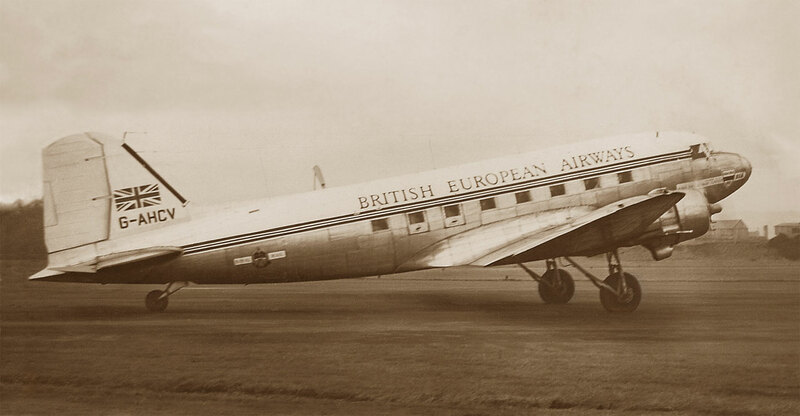 G-AHCV Douglas C-47A Dakota 3 Pionair (12443) "Sir George Cayley" of BEA at Renfrew. Broken up at Southend in January 1970 after having been languishing there since 28 March 1966.